Which is the best saree fabric, cotton or silk? Nowadays when you go for saree shopping you will be amazed at seeing the variety available in the market. To keep up with the changing trend and lifestyle of women, sarees are manufactured in every possible color, shade, texture, styling and fabric. Innovative drapes of sarees are found as a result of the creativity of modern women. 1. Different fabrics have the different type of fall and texture and all of them are not recommended for the weaving of this outstanding feminine attire of saree. Too many types of fabric may create some confusion. So only two types of fabric namely cotton and silk have been taken into consideration to make a comparative study in this blog. 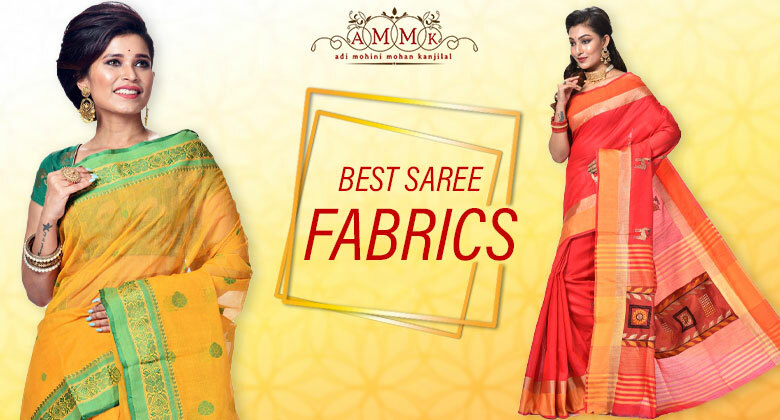 Cotton and silk fabric are your prime concern when you want to buy sarees for yourself after doing a survey in the market. Kota Doria- These sarees are from Rajasthan area of India. These are very lightweight sarees that utilize a multigauge yarn to create a checkered look in the weave of the cloth. The original Kota Doria sarees are made around Kota city of Rajasthan and they are of very expensive type. Sambalpuri and Bichitrapuri saree – These are the product of Orissa which involve technique of Ikkat in its’ process of weaving. These are hand woven sarees depicting contrasting geometric patterns. Taant cotton sarees are products of West Bengal which are very user-friendly and decent in look. There is a wide variety of taant cotton saree in the market and you can pick up your choice most easily from them. In our country where summer continues for a long period of time, taant cotton sarees are a real helpline for the ladies who wear saree only in their day to day life. Silk fabric came to India from China through trading via silk route which exists till today. Now India is one of the main producers of silk fabrics in the international market. Silk comes from silkworm and silk fabrics are used for so many types of silk sarees in India Like Banarasi, Kanjivaram, Tissue, chanderi, Gadwal, Baluchari and so on. Banarasi sarees are topmost on the list of bridal as well as party related saree. These are originated from the holy city of Baranasi. This is weaved with thick silk fabric and gold or silver zari work is done either on pallu and border or covering the saree all over. Banarasi sarees are of various types like Zardousi, Karhial, Brocade, Tanchoi, Butidar, Jangla etc. Red Banarasi saree is the most chosen one for bridal all around India over the years. It is famous for its silk fabric, lovely shades of color and excellent zari work. Kanjivaram silk sarees are also famous in South India which is called the silk hub of this country. At down south this saree in big parties worn for bridal as well as for big parties. Silk fabric is used for weaving of these sarees. In fact, the wedding is incomplete without a Kanjivaram silk saree for many brides. Kanchipuram town of Tamil Nadu is the originating place for Kanjivaram sarees. Tissue and Chanderi silk are weaved with silk yarn but these are very lightweight sarees. These are appreciated all over India for its’ decent look and user-friendly material. Gadwal sarees of Andhra Pradesh again is of silk fabric and it has zari work in its border and pallu. These are very expensive silk sarees and mostly kept rolled around a stick for its well being. Silk Gadwal sarees have their specific buyers who will not compromise for any other type. Baluchari sarees are the product of WestBengal which is weaved with silk fabric that is extremely durable in nature. These days in designers Baluchori sarees, stories from Ramayana and Mahabharata is weaved on the border and pallu of these sarees to make them exclusive and beautiful. The story of silk and cotton fabrics are never-ending in these days fashion world. Silk and cotton sarees both are very unique in nature and each has its own use in the life of womenfolk in India. Silk looks more glamorous while cotton is much chosen for its sober and decent look. Since glamour rules over the market of fashion world of today, silk fabric rises much above in rating compared to cotton fabric by its users in the modern lifestyle of these days.